As people who often work with our hands, we often have to carry heavy tools from place to place. Schlepping these types of items up a ladder, into a crawlspace, or up a set of stairs, can reduce your productivity, since you’ll be spending your energy just getting to the place you need to work. Fortunately, this is where a great tool belt really helps us organize and heft our tools. A quality model will evenly distribute the weight so that it won’t be as noticeable. We put together a list of great belts that will help you complete your workload with ease. If you don’t know a lot about what makes a good tool belt, then this is a great place to start. Our Gold Pick tool belt packs in a bevy of great features, and like other picks of its type, it’s generally beloved by trades folk and critical groups alike. 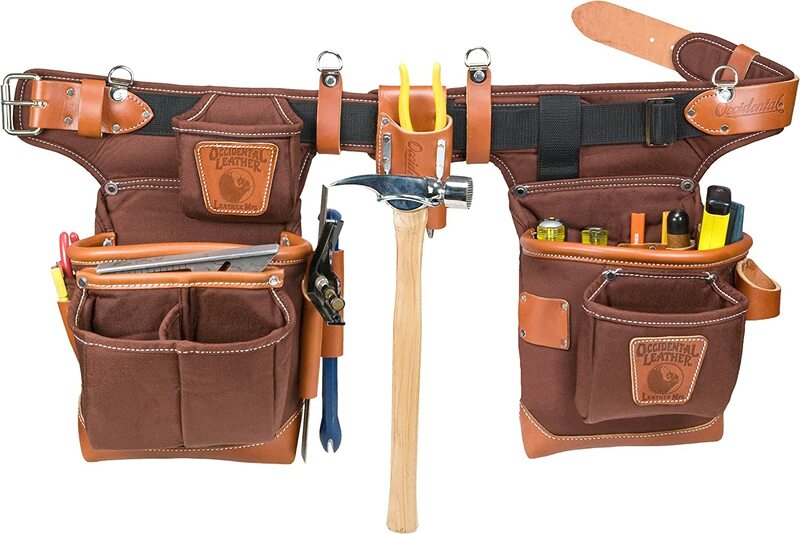 Produced by the master leathersmiths at Occidental Leather, this tool belt will serve you well on any worksite. Having specialized in developing leather tool belts and accessories for 36 years, you can be assured that any leather tool management system developed by Occidental Leather will be a quality product that will be the MVP of your worksite. To start, this model of tool belt is sturdy. The leather that Occidental selected is durable and rugged, yet supple enough to give you a decent degree of maneuverability. It features two, large hand-specific tool holders that will help carpenters and tradesmen to quickly access their tools, even when holding onto a ladder or another available surface. The leather is soft on the outside and tough on the insides of each pocket, and side features a “Fat Lip” design that is crafted to provide an absolute ton of space for tool and accessory storage. Each of the main pockets features stitched leather reinforcement, so that you won’t have to worry if you forget to cover the blade of your cutter when you put it away in a blade down position. This tool belt will accommodate waists as large as 40 inches, and unlike other all leather tool belts, the leather isn’t stiff and unyielding. When it comes to storage, you’ll find that this tool belt has room for a goodly amount of tools. These include a pocket for pencils, a holder for a knife, and a chisel sleeve. The upper left bag even holds tape or fasteners with ease. When you need to measure, there’s also a pocket designed to hold rafter sleeves, one designed to holster a combination square, and even a slot for a lumber crayon. Since leather tool belts are able to hold so many heavy items, it’s great to know that this product can easily manage larger items; there’s a dedicated loop for a hammer, a cat’s paw sleeve, and extra sleeve pockets for larger items like flashlights. To round it all off, the left side Fat Lip pocket has two individual compartments that are perfect for holding nails and fasteners. Keeping a plethora of pockets is the name of the game with our Silver Pick product. 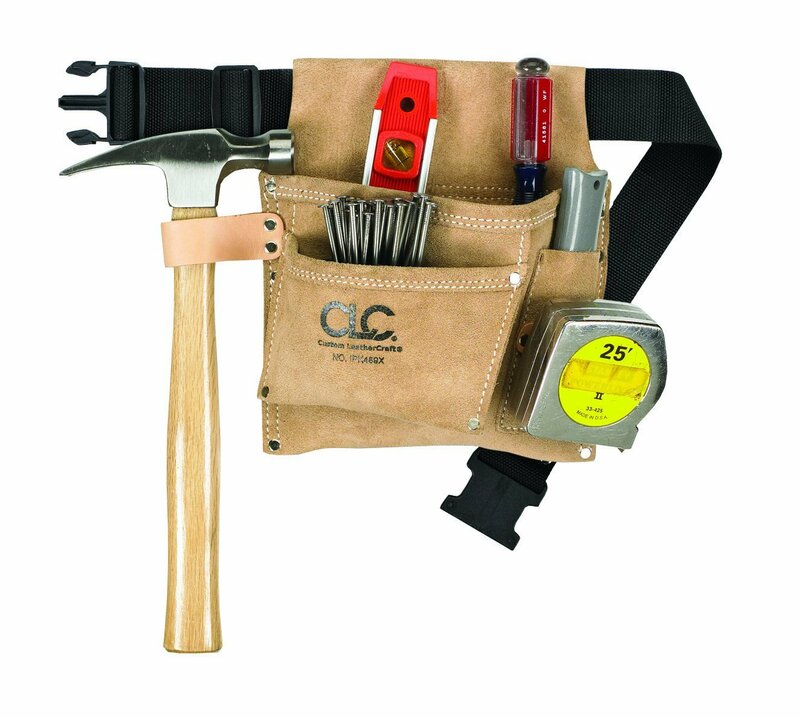 Developed by another manufacturer whose leather crafters are well renowned for their expertise, this Comfortlift combo tool belt is perfect for any carpenter looking for a product that can provide all of the storage needed on a professional or private job site. While not actually comprised of leather, this is one durable tool belt that uses 600D cordura polyester in its design; a material that is at once pliable and tough. Similarly to our Gold Pick, this tool belt has a hand specific setup that puts your tools easily in reach while you work. Unlike our Gold Pick, which relegates weight distribution to the hip area, this tool belt includes an attached set of shoulder straps that places some of the weight on your shoulders; a feature that makes it much easier to heft heavy tools. These shoulder straps are padded and are comprised of a strong nylon that won’t buckle or break. This is offered for the Occidental Leather belt, but only through a separate purchase. With such a balanced weight distribution system, it’s also good to know that putting on and taking off this tool belt is made easy by two sturdy handles that are attached to each hand specific tool holder. This really adds additional stability when you need to take your heavy tool belt in hand, and protects your muscles from extra strain at the end of your work day. The whole belt buckles with a two prong system that ensures that your heavy tools won’t put undue stress on the belt’s buckling mechanism. The belt itself, with its 11 belt holes will accommodate waist sizes of up to 46 inches. In the rear of the belt there is a small patch that has a sturdy metal loop. This loop is for carrying a hammer, which places the hammer squarely in the middle of your back. Fortunately, the hammer will be fully backed by more of the tool belt’s heavy duty material, so the handle shouldn’t hit your rear too frequently during your work. Nevertheless, this positioning will be very subjective, as everyone might not want a heavy hammer down the center of their back when they are climbing a ladder, so this might be something that you should consider before purchasing this tool belt. To keep your tools secure and your sharps safely stored, the pockets employ both the aforementioned cordura as well as ballistic binding. As mentioned before, pockets are the name of the game, and this tool belt utilizes a full complement of 23 protected pockets. There’s space for a full rafter square, a bevy of small tool pockets, and a space specifically designed to accommodate a tape measure clip. In addition to these tool carrying features, you’ll find plenty of space for nails, fasteners, and smaller tools. Not many brands exemplify outdoor work like Carhartt. Anyone who’s worked on a job site has seen coworkers and foremen who utilize the company’s famous line of jackets to ward off the cold conditions and protect against the rigors of the jobsite. Carhartt has made an extensive name for themselves, and there are few brands on the market today that have such a great reputation for dependability. Our Bronze Pick, which is the Legacy Tool Belt from the company, is a great belt that draws from Carhartt’s legendary history. Firstly, you’ll notice that when it comes to coloration and design, this tool belt is a great match for almost any of Carhartt’s canvas or wool work jackets. It comes in two colors, Carhartt brown and black. Each pocket on the Carhartt brown version has stitched borders on the tops that provide extra durability and wear resistance. The belt and all of the pockets are made of 1200D polyester; one of the toughest versions of the material on the market today. Carhartt settled on a total of eight of these durable pockets; each of a different size that will accommodate different tools. Like our other products, this tool belt comes with a dedicated hammer loop. The hammer loop is located on the right side pocket area, and is on the outermost edge of this section of the tool belt. There are also two additional webbing loops included with this product that will help you store other objects like flashlights and cat’s paws. 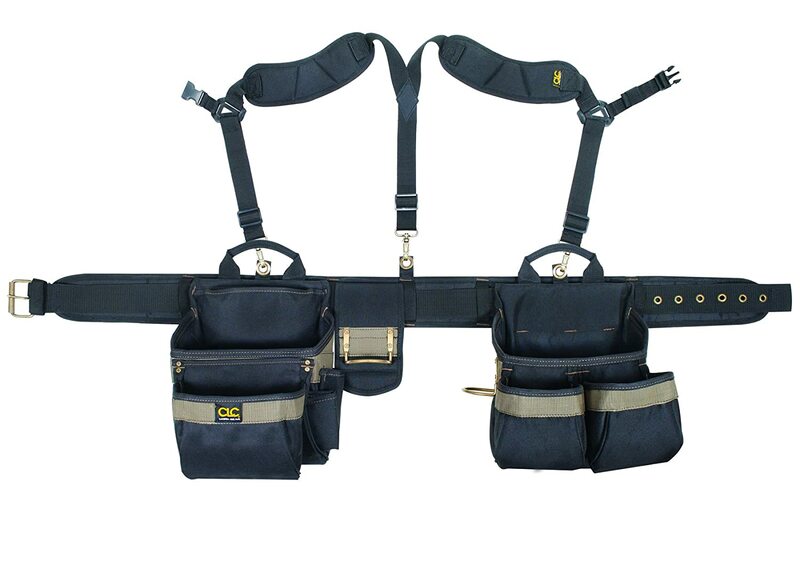 As a fully waist mounted unit that features a smaller amount of pockets than our other tool belts, you’ll only be able to place a moderate amount of tools and accessories in your pockets, while this may be a deal breaker to some, this makes this product perfect for the mid-level jobsite. Also, this belt comes in at a maximum size of 40 inches, so if you have a large waist, you might want to try another unit. If you manage a large worksite and need a great tool belt to distribute to your workers, then this is a great ballin’ on a budget product that will ensure your employees will have the tools they need without the worry of an unreliable product. Our budget pick is another Custom Leathercraft belt that differs from our Silver Pick as it employs a single pocket solution to ensure ease of use. As masters of leather, Custom Leathercraft utilizes a suede material for this tool belt. Suede is a great material for this purpose as it is durable, yet supple enough not to get in the way while you work, and while most of the other products on our list use double tool holders, this is a great lightweight belt that makes moving while you work a real cinch. This belt has two large pockets for tool storage, is colored a bright tan, which is easy to eyeball when you need it, and has a very strong polyester belt that’s fully adjustable; the max waist for this belt is 46 inches. There’s a loop for a tape measure clip, a dedicated leather loop for a hammer, and a sleeve for a cutter or small flashlight. Either pocket can be used for fasters or nails, so you shouldn’t have to worry about these items as you work. • Leather – Simply put, leather is going to be your most durable option when it comes to these types of products. You will be able to hold heavier objects on this type of belt without fear of tearage. Also, if you intend to work with sharps like exacto knives, box cutters, or even spades, you’ll want a tough, cut-resistant & some other material like leather repair kit to help protect from injury as you move around. • Cloth – As you might have guessed, cloth is a much thinner material that isn’t quite as cut-resistant as leather. Also, you won’t be able to truck as many heavy items like hammers in a cloth tool belt, so what’s the point of one of these types? Well, cloth tool belts offer more maneuverability than leather products. Also, it’s very easy to fish screws and nails out of a cloth tool belt because of how pliable the material is. • Polyester Canvas – This is a nice in-between for materials. Polyester is the material that’s found in those ultra-durable yet light Dickies jackets. Unlike leather and cloth, polyester is amazingly water-resistant and has a high flexibility level. Its tendency to be easily marred and the fact that this material easily sags can be deal breakers for some tradesmen. • Nylon – Nylon is another great, more durable alternative to the traditional cloth product. Nylon isn’t great for sharps, but it’s excellent at carrying tools that are in the mid-range weight class. It can snag, so consider this if you’re going to be working in tight quarters with a lot of jutting nails and splinters. Also, like polyester canvas types, this style of tool belt tends to sag when overburdened. • Suede – This material, as a variant of leather, is quite sturdy and will accommodate heavier tools like hammers and drills, yet is also pliable enough for work that requires extended dexterity. While it isn’t quite as durable as hard molded leather, this is still a great material that you can use if you plan on working with sharps. There is one caveat: excess moisture can cause damage to this type of tool belt, so be careful on worksites that have excessive exposure to water or other liquids. These are add-on options for your tool belt. Some tool belts come with these, and some will require an additional purchase. These pouches are typically made of more durable materials like leather or suede because you’ll be using these to stow your sharps, such as nails, razors, or box cutters. These are made to be easily slipped on, via a zippering system or a latched, clip-on system, and are designed to be easily opened with one hand; even if you are wearing work gloves. When looking for a new tool belt, definitely consider grabbing one that comes with these types of slip-on pouches. If you can’t find one to your liking that does include this feature, add-ons won’t set you back by a lot, so purchasing a separate unit would be in your best interest. In addition to these extra pouches, consider grabbing a tool belt that has loops or belt hooks. You can even seek one that employs a carabiner clip. These loops will help you easily attach tools that are connected to lanyard, or looped tools like close-ended wrenches. Having this extra storability, will ensure that the tools that don’t fit in your tool belt’s pouches, will have a place where you can still reach them easily. Trekking your tools from place to place can be an arduous task that is made exponentially easier by using a tool belt. As you’ve seen from our pre-purchase considerations and the rest of this guide, these items come in a variety of materials, styles, and can even vary greatly in price. We hope this guide has provided you with your future tool belt, as all of the products listed here are great belts that will provide years of use to the experienced craftsman, or the average DIYer.